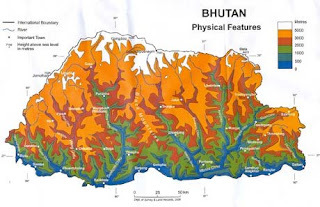 Bhutan - a cuddly little egg of a Buddhist kingdom tucked obscurely into the Himalayan Mountains - makes for a rather exciting topographical map, no? The term was coined by Bhutan's former King Jigme Singye Wangchuck in 1972 soon after the demise of his father King Jigme Dorji Wangchuk who has opened up Bhutan to the age of modernization. It signaled his commitment to building an economy that would serve Bhutan's unique culture based on Buddhist spiritual values. Like many moral goals, it is somewhat easier to state than to define. Nonetheless, it serves as a unifying vision for the Five Year planning process and all the derived planning documents that guide the economic and development plans of the country. But consdier the most intractable problems we face: poverty; malnutrition; deforestation; climate change. In all these cases, simple economic calculation doesn't provide the incentives to solve the problems. But the economic growth paradigm is sacrosanct - no politician dares to challenge it. But Bhutan has. And here's the thing: until we start thinking in terms of GNH, rather than GDP, we're not going to be able to solve any of those problems. We're just not.